More than a decade ago, in the middle of the 2008 financial crisis, the annual JRI conference was, not surprisingly, somewhat side-tracked by the implications of that crisis for the environmental movement. Somebody (not one of the main speakers) suggested that the time had come for new economic structures now that the old ones had so signally failed, and that these could be designed to address the environmental crisis. This was largely ignored, indeed at one point specifically repudiated. The way ahead, it was claimed, was to work through the existing structures and to use them to obtain an increasingly green agenda. To this end there was much talk about the importance of the upcoming Copenhagen conference. Let me also mention what will not work in our attempt to save the planet. What will not work is what I call the ‘leaving it to’ syndrome. We cannot leave it to the scientists. There is no techno fix, no magic bullet. If we do not have the political will, if we do not change our attitudes, then no amount of clever technology will save us. We cannot leave it to corporations. No amount of ‘greenwash’ can hide the fact that they are part of the problem rather than the solution. By their very constitution they are committed to growth, indeed growth at all costs. Only force, legal or otherwise, restrains them. We cannot leave it to governments. Think of what happened at Copenhagen. There have been better moments since – Paris 2015 e.g. – but the fact remains that at the end of 2018 we are still pumping unacceptable amounts of carbon into the atmosphere. Though ultimately we cannot ignore the exercise of power, the world governments (East and West, North and South, democratic and undemocratic, small and great) seem at present too timid, too narrowly focussed on their own interests, too bureaucratically encumbered, to get the job done. So, if we know what we need and know what does not work, how do we get from here to there? Here are some initial suggestions. Concentrate on ideologies and attitudes rather than technologies. There is a crucial theological battle to be won here. The Quaker Douglas Gwyn speaks about ‘the apocalypse of the word’. ‘The apocalypse of the word is the only power in the world more powerful than the atomic, ecological, and/or genetic apocalypses we now face’, he says. Stop supporting the present political system. For example, try to vote for a party which genuinely wants to take the political crisis of environmental inertia seriously. Get more and better information about green economics. Learn what an alternative economics looks like. Do not by any means accept the ‘there is no alternative’ line of argument. We can learn to do a better job of organising our lives – the way we eat, the way we work, the way we travel, the way we holiday, the way we handle money and pay our taxes, the way we exchange and so on. When I say ‘we’ I do not mean just environmentalists but rather ‘we’ as a society, a world. 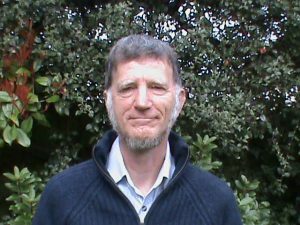 Jonathan Ingleby is a former lecturer in Applied Theology at Redcliffe College, Gloucester. Previously, he worked in education for more than twenty years in India. He lives in Gloucester and is active in local environmental politics. “What is the world coming to? Ecological crisis and Christian hope.” Redcliffe/JRI annual conference, 19 January 2008. The speakers were Ernest Lucas, Margot Hodson and Dave Bookless, with Martin Hodson chairing.